On December 16, 2017 at 4:15 p.m. Officer DiCenso spoke to a female reporting party at the police station who had concerns that a former employee had used the businesses credit card without authorization. She stated that a woman was hired in July 2016 as an office manager. The reporting party learned shortly before coming to speak with Officer DiCenso that the office manager had begun utilizing an office credit card for personal purchases in October 2016 and had made several unauthorized purchases between October 2016 and November 2017. Officer DiCenso investigated the incident by speaking with several retailers where the credit card was used and on July 23, 2018. The woman was taken into custody, transported to the station, booked in the usual manner, afforded all rights and later released on personal recognizance. On July 27, 2018 at 8:30 p.m. 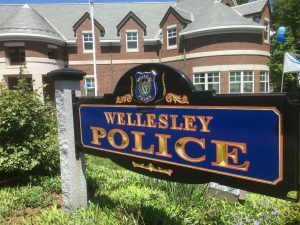 Officer DeBernardi was on patrol on Washington Street when he observed a man who he was familiar with and was aware that there was an active probation warrant issued by the Westborough District Court for his arrest. The man was taken into custody, transported to the station, booked in the usual manner, afforded all rights and transported to the Norfolk County House of Correction where he was held until he could appear in court on July, 30, 2018. On July 28, 2018 at 10:15 a.m. Officer Shore was on patrol on Worcester Street when he observed a Ford van and conducted a query of the vehicle’s registration to confirm the status of the registration. The query revealed that there was an active default warrant issued by the Quincy District Court for the owner. Officer Shore stopped the vehicle and spoke with the operator and took him into custody. He was taken into custody, transported to the station, booked in the usual manner, afforded all rights and later released on $150 bail. On July 28, 2018 at 12:20 p.m. Officer Shore was on patrol on Worcester Street when he observed a Nissan sedan with an expired inspection sticker. He stopped the vehicle on Worcester Street at Route 16 and spoke with the operator. A query of the man’s information showed that his license was suspended. He was taken into custody, transported to the station, booked in the usual manner, afforded all rights and later released on $500 bail. On July 23, 2018 at 2:28 p.m. Officer J. Popovski spoke to a female reporting party at the police station who is a real estate broker who became aware that some of her clients were receiving letters with negative information about her. She was able to retrieve two of the letters sent to clients and provided them to Officer Popovski who will work with Detective D’Innocenzo to investigate the harassment. On July 23, 2018 at 3:47 Officer R. Poirier spoke with a female reporting party who resides on Washington Street about a collection notice she received for a credit card she did not open. Officer Poirier is investigating. On July 24, 2018 at 8:00 p.m. Officer Dixon was spoke with a female party at the police station regarding fraudulent charges totaling $500,000 on fraudulent credit card account in her name. Officer Dixon is investigating. On July 25, 2018 at 9:28 a.m. Officer Keenan was dispatched to a cellular tower on Worcester Street for a report of copper wiring being stolen from the tower. The incident is under investigation. On July 26, 2018 at 7:50 p.m. officers were dispatched to Roanake Road for a report of a missing 7-year-old child. Officer spoke with the parents and began checking the area. There is a brook path in the area and officers checked the brook path and located the child on the path near Cottage Street. The child was returned safely to her parents. On July 26, 2018 at 10:50 p.m. Officer Dixon was dispatched to a residence on Arlington Road to speak with a female party regarding youths that had rung her doorbell and then threw food at her when she opened the door. Officers checked the area and were unable to locate any youths. No similar incidents were reported. On July 28, 2018 at 1:48 p.m. Officer Gerard was dispatched to the Whole Foods parking lot for a report of a dog left unattended in a vehicle. Officer Gerard located the vehicle with the windows open slightly. The vehicle’s engine was not running and it was approximately 86 degrees out. The owner of the vehicle was located and was advised that ACO Webb would be notified about the incident and would follow up with her.